Each "SID" or Lab Interface Computer should have a "SpecVetUseOnly" folder. 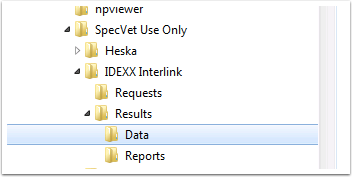 In it, there should be something like an IVLS Interlink Folder, and then folders for REQUESTS; RESULTS [DATA; REPORTS]. Check the Data Folder, and ensure that there are no <SPACES> in the file names for the XML files. If there are, remove those spaces, which will then allow SpecVet to import the results. Since they probably were manually entered on the IVLS, they most likely will then be orphan labs. Check to make sure FileZilla is running. If you launch admin console for filezilla, you will not see "old" activity, but within 5 or so minutes, you should see some activity as the server is going to that workstation to pull results.